My last post, about ‘things men have made’ (D.H. Lawrence), reminded me of the summer when I travelled by train from Paris to the south of France. Sitting on a bench at a railway station – perhaps Nîmes, perhaps a much smaller place called Alès – I saw a man standing in the open doorway of a train. He was perfectly framed there, each hand resting comfortably on a side wall, his head not quite touching the archway above. It struck me that (yes, obviously!) we design and make trains human-sized, for human use, under human control. 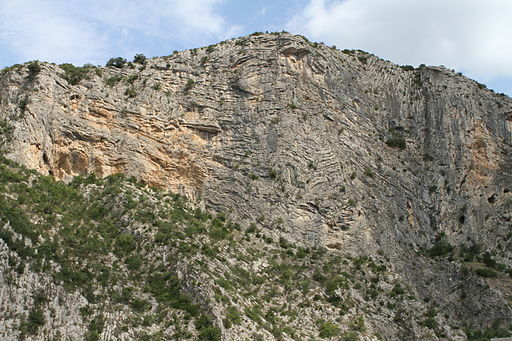 When I arrived at the campsite where I was to stay for a fortnight, near the town of Anduze, I found that it was on a cliff-top above a river gorge. These cliffs were not human-sized, designed and made for human use. The man I’d seen on the train, if standing against these sheer walls, would be dwarfed, not framed by them. At night-time on the beach by that river, the Milky Way was visible with a brightness of individual massed stars that I had never seen before and have never seen since. The stream of stars followed the course of the river, like a reflection of the water beneath. The feeling evoked by both these sights, the cliffs and the river of stars, was awe. I was confronted by something seemingly boundless, not made to fit and frame a human being – something that existed for its own sake, regardless of our human needs. Of course, human-made artefacts can be awe-inspiring as well, such as rockets, oceangoing liners or magnificent bridges. Ironically, though, many of them are designed for the purpose of bringing awe-inspiring natural phenomena – space, the roaring seas – under our control, thus reducing their awesomeness. In the 18th century, there was a fashion for bringing whole landscapes under control. Wealthy landowners paid for the view from their stately homes to be carefully shaped, placing grassy banks, trees and lakes in combinations that seemed to be ‘natural’ but were actually contrived to create perfectly proportioned ‘picturesque’ vistas – making the physical environment into something that might be seen in a painting, surrounded by a frame. When we see something awesome, our instinct is often to try to tame it. We seem reluctant to leave anything out of our control. We try to make ourselves ‘the measure of all things’ (Protagorus). I wonder – is there anything made by human hands that is awe-inspiring in itself but doesn’t also tame the awesomeness of nature? This entry was posted in Uncategorized and tagged Awe, cliffs, France, nature, picturesque, River. Bookmark the permalink.